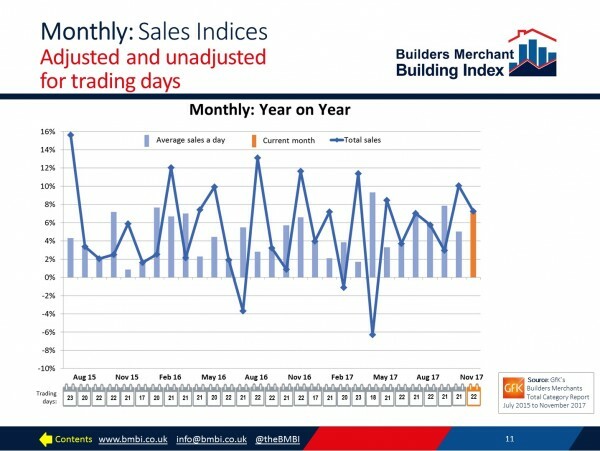 BMBI data shows builders merchants’ total value sales saw a 7.3% increase in November 2017 when compared with the same month in the year previous. Seven categories in total did better; with Landscaping (+9.0%), Ironmongery (+8.2%), Tools (+8.0%) and Heavy Building Materials (+7.8%) all enjoying extremely fruitful periods. Encountering lower growth were Plumbing Heating & Electrical (+7.4%) and Kitchens & Bathrooms (+6.2%) although they did enjoy their highest monthly sales since BMBI data started being collected by GfK in July 2014. The only category to see a dip in sales year on year was Workwear & Safetywear, which went down by 1.6%. Tony France (above photo), Sales Director, Ibstock and BMBI’s Expert for Bricks commented on how builders merchants’ brick sales stayed strong, with the volume of bricks in merchants’ depots returning to normal and stockists generally reporting healthy demand. He spoke about how evidence implied a greater numbers of detached, semi-detached houses and bungalows being built, but fewer flats and apartments. As a result, this means more bricks are needed to build the average unit and, therefore, demand for bricks has been at a particularly high level. “In the 12 months to the end of September 2017, GB brick manufacturers despatched 176m more bricks than they collectively produced, resulting in depletion of stocks at many factories and, therefore longer ‘availabilities’,” he said. “These figures exclude volumes of imported bricks, which are continuing to rise to supplement GB supply.